Elearning! 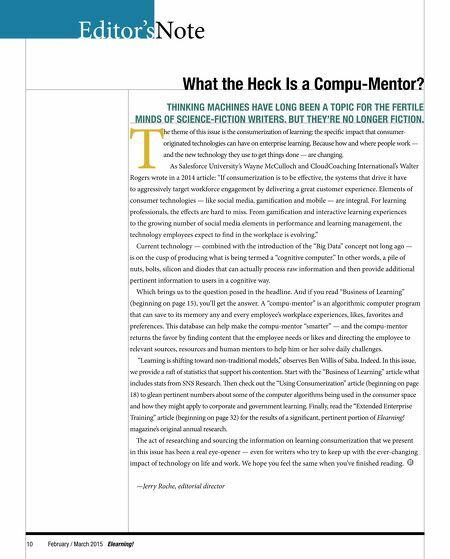 Magazine: Building Smarter Companies via Learning & Workplace Technologies. Executives Use Confdence in the Economy to Set Strategies The findings in a survey from Deloitte Growth Enterprise Services show how mid-market companies are translating increased confi- dence in the economy into action: hiring new employees, investing in new technology solutions and other equipment, and acquiring businesses to reach new markets. Key fndings: >> 45% of mid-market executives are "extremely" or "very" confdent that the economy will continue to improve over the next 24 months — compared to just 10 percent in spring 2014. >> 63% say they expect to increase their full-time domestic workforce in the coming year, compared to 43 percent in spring 2014. >> 46% say they are likely, or very likely, to purchase another company in the coming year, a signifcant jump from the 31 percent who held the same view just six months ago. —Download the report: www2.deloitte.com/us/en/pages/deloitte- growth-enterprise-services/articles/americas-economic-engine- opening-the-throttle.html Elearning! February / March 2015 11 News Federal Bandwidth Auction 'Blows Away' Estimates Cellular carriers spent $44.9 billion during a recent auction of wireless frequencies by the Federal Communications Commission. The eye-popping bids that blew past even the highest government estimates are a testament to soaring demand for mobile Internet service. These frequencies, also known as spectrum, are needed to expand cellular networks so they can carry more phone calls and data. The additional bandwidth will help cell customers stream high-quality videos and download apps more quickly. Without suffcient airwaves, wireless networks can become congested and slow. 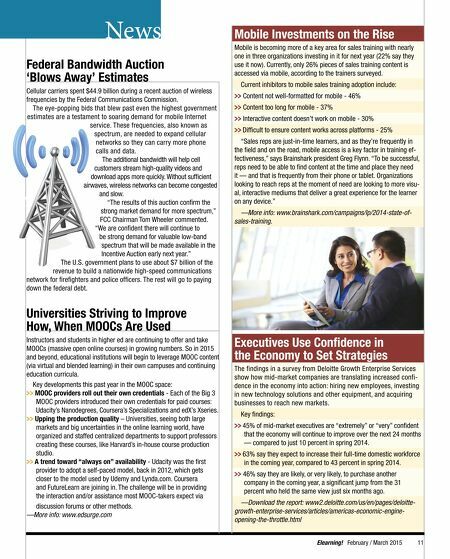 "The results of this auction confrm the strong market demand for more spectrum," FCC Chairman Tom Wheeler commented. "We are confdent there will continue to be strong demand for valuable low-band spectrum that will be made available in the Incentive Auction early next year." The U.S. government plans to use about $7 billion of the revenue to build a nationwide high-speed communications network for frefghters and police offcers. The rest will go to paying down the federal debt. Universities Striving to Improve How, When MOOCs Are Used Instructors and students in higher ed are continuing to offer and take MOOCs (massive open online courses) in growing numbers. So in 2015 and beyond, educational institutions will begin to leverage MOOC content (via virtual and blended learning) in their own campuses and continuing education curricula. Key developments this past year in the MOOC space: >> MOOC providers roll out their own credentials - Each of the Big 3 MOOC providers introduced their own credentials for paid courses: Udacity's Nanodegrees, Coursera's Specializations and edX's Xseries. >> Upping the production quality – Universities, seeing both large markets and big uncertainties in the online learning world, have organized and staffed centralized departments to support professors creating these courses, like Harvard's in-house course production studio. >> A trend toward "always on" availability - Udacity was the frst provider to adopt a self-paced model, back in 2012, which gets closer to the model used by Udemy and Lynda.com. Coursera and FutureLearn are joining in. The challenge will be in providing the interaction and/or assistance most MOOC-takers expect via discussion forums or other methods. —More info: www.edsurge.com Mobile Investments on the Rise Mobile is becoming more of a key area for sales training with nearly one in three organizations investing in it for next year (22% say they use it now). Currently, only 26% pieces of sales training content is accessed via mobile, according to the trainers surveyed. Current inhibitors to mobile sales training adoption include: >> Content not well-formatted for mobile - 46% >> Content too long for mobile - 37% >> Interactive content doesn't work on mobile - 30% >> Diffcult to ensure content works across platforms - 25% "Sales reps are just-in-time learners, and as they're frequently in the feld and on the road, mobile access is a key factor in training ef- fectiveness," says Brainshark president Greg Flynn. "To be successful, reps need to be able to fnd content at the time and place they need it — and that is frequently from their phone or tablet. Organizations looking to reach reps at the moment of need are looking to more visu- al, interactive mediums that deliver a great experience for the learner on any device." —More info: www.brainshark.com/campaigns/lp/2014-state-of- sales-training.